If you thought you had a miserable time in traffic this morning, you’ve got nothing on the World Rally Championship. The first loop of Rally Mexico including stages 2 and 3 have been cancelled because the cars’ transporters are still stuck in traffic. 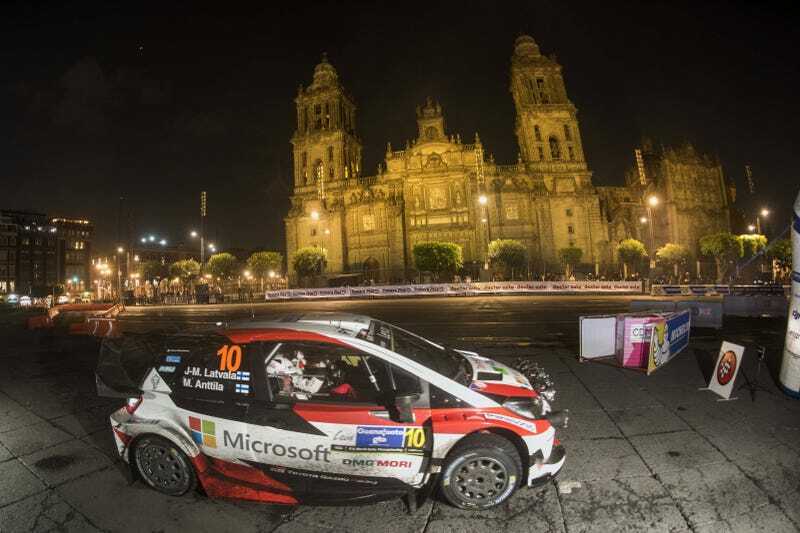 Last night, the WRC opened with a spectacular special stage in central Mexico City’s Zócalo square. We got to see rally cars hoon through a James Bond movie backdrop and move around a bollard in the middle of a particularly tight donut on the super special. The only problem with this pretty backdrop is that it’s hours away from the start of the second stage, which is nearly 250 miles away in Leon, per the WRC. The cars didn’t make it in time, so the morning loop including Stages 2 and 3 have been cancelled. A new itinerary will be coming out later today. A traffic jam caused by a roadblock for an accident held up everyone’s transporters as they left Mexico City, reports Motorsport-Total. Per a tweet by WRC commentator Colin Clark, Hyundai’s cars were still 186 miles from the service park as of 7:30 a.m. local time. Suddenly, I feel a lot better about Austin’s garbage traffic—and I’m also sad because there are no WRC cars running yet. Where are the cars? Please bring the cars.